Car accident at Boudreaux in NW Houston. TOMBALL (KTRK) -- Two people were transported to the hospital after a crash involving an armored truck Saturday near Tomball. 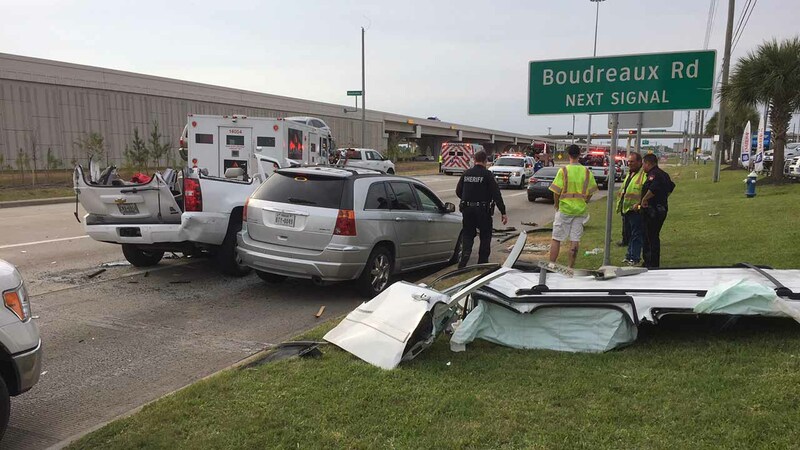 The crash happened around 4pm on 249 and the north feeder at Boudreaux, south of Tomball. According to investigators, a white SUV crashed into a white Ford truck, then hit a Loomis armored vehicle and hit a silver Chrysler. The driver of the SUV was taken the hospital by LifeFlight. He is listed in critical condition. The driver of the Chrysler was taken to the hospital and is expected to be OK. The driver of the white Ford was not injured.